V9.com looks like a very legitimate search engine at first sight. There is a search bar on this search engine and easy-access links that can help to access popular websites. V9.com itself seems to be aimed at Russian users mainly because all the text is in Russian on this search provider. Unfortunately, we cannot say that V9.com is a legitimate search engine. In fact, researchers classify this search provider as a browser hijacker. The reason is simple – V9.com appears on Internet Explorer, Google Chrome, and Mozilla Firefox without permission. If this has already happened to you, delete V9.com browser hijacker as soon as possible and set another search engine instead of it. Unfortunately, it is really hard to uninstall V9.com browser hijacker. It cannot be erased via Control Panel like other programs. Therefore, we suggest that you read through the article to find more information on that. 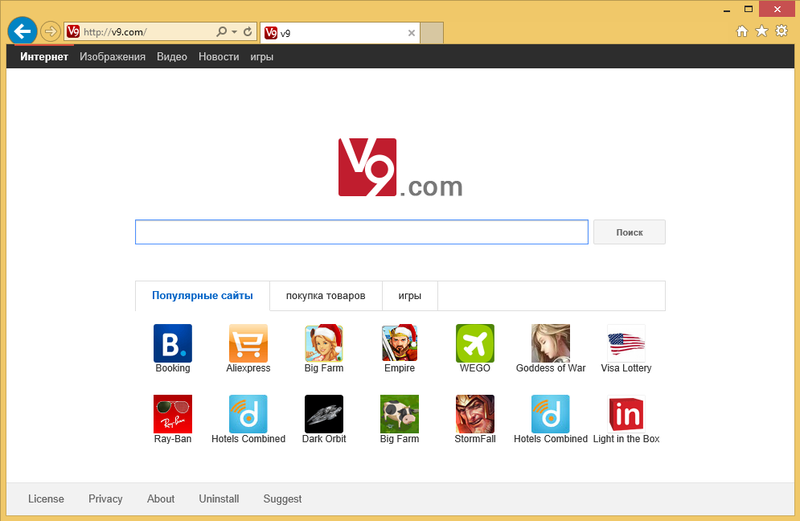 What does V9.com browser hijacker really do? As V9.com is a typical browser hijacker, it will undoubtedly change your homepage and search engine without permission. Even though V9.com looks legitimate, we do not think that it is the best idea to use it as your primary search provider because it might provide you with sponsored links and ads that can redirect to corrupted web pages. The same might happen if you keep clicking on these easy-access links placed on its main page. Yes, some of them will take you to popular websites; however, others might lead you straight to suspicious websites. V9.com browser hijacker will also record information about you. This is another reason why you have to remove V9.com from your PC as soon as you can. Remember, there are hundreds of other browser hijackers on the web. Therefore, you should be very careful. How did V9.com browser hijacker enter my system? We are sure that you have not set V9.com yourself. Research has shown that this browser hijacker usually enters systems together with free legitimate programs because it is distributed in software bundles. As you have downloaded and installed a free program yourself, it means that you have installed V9.com browser hijacker unknowingly too. There are hundreds of other undesirable programs that are distributed the same way. Therefore, we suggest installing a security tool on the system. You should stop downloading programs from free web pages too because bad programs often attach to such applications. How to get rid of V9.com browser hijacker? There is no point in keeping V9.com as your search engine because it is unreliable and might even cause harm to your PC. Luckily, you can implement the V9.com removal rather easily. There are two ways to do that. You can either delete V9.com browser hijacker manually or automatically. In our opinion, it is easier to remove V9.com browser hijacker automatically because you only have to acquire a security tool Wipersoft, install it, and then scan your system with it.